Being the capital of Laos, Luang Prabang has a lot to offer; from day treks across the mountains visiting local villages to a day out with the elephants or a relaxing cruise down the Mekong River. 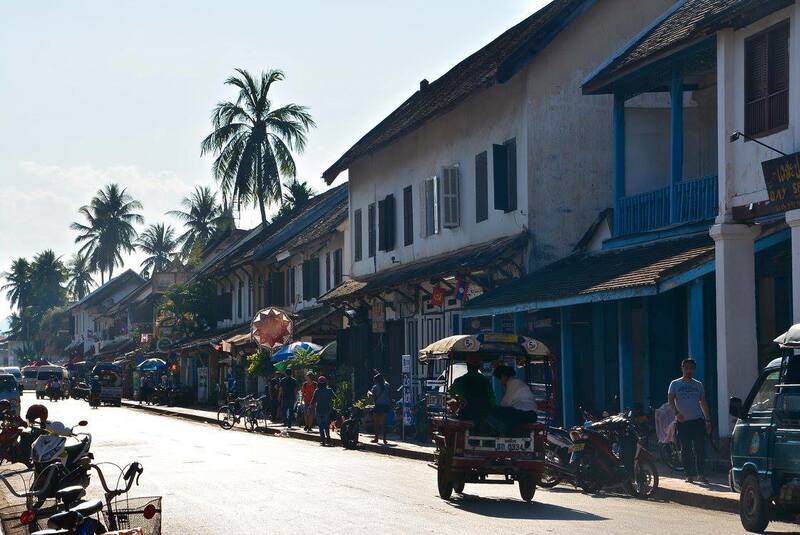 Luang Prabang is a perfect place for a backpacker’s quick stop-off or a luxury, relaxing holiday for the family. During my time in Luang Prabang I chose to do one day tour so I had a beak away from the city madness, one full day in the city and a morning relaxing by the river before heading off again. You need to spend at least a day or half a day exploring the city. Luang Prabang is a very small city compared to the ones you are probably used to; London, Sydney, Tokyo, New York…Luang Prabang will seem more like a town to you once you get an idea of the size of it. To get this perspective of how small it is, you can take a quick 15 minute climb up the Chomsy Hill where you will find a temple sitting at the top and views of the whole city and mountainous backgrounds. The views are pretty spectacular and it’s a perfect place to get that ‘Instagram-worthy’ photo. On the walk down you will pass several buddha’s and a few caves which are interesting to see and find out the history behind them. You will eventually find yourself walking through some local’s courtyards before making your way back onto the main street. Take some time to explore the narrow streets of Luang Prabang and grab your lunch either on the main street to enjoy the everyday local madness or take a seat in a cafe/restaurant by the river to enjoy the calming, flowing river. You can rent a bike to go around the city in. It is safer to do so than many of the Asian countries as the city is very quiet and the drivers are more sensible than countries like Vietnam or Cambodia. End the day by taking a stroll along the beach and finding the perfect spot to sit and enjoy the beautiful sunset. This is very popular amongst tourists and the locals. As you walk down the main street of Luang Prabang, you will get past a point where nearly every other shop is a tour office. Many of them offer similar/the same tours; for example, the Kuangsi Waterfall is a very popular tour as it’s the most famous Waterfall in the area. If you aren’t after a tour for this, there are tuk tuks which will take you at your own pace. The tours range from a few days of trekking through the tall mountains to kayaking and cycling beyond the city; from visiting local villages to a city temple tour. I came to Laos wanting to spend a day or half a day with elephants but I am very anti-riding elephants so I was determined to find a tour which didn’t offer this. With all the tours having part of their descriptions (some in small writing which is very naughty of them) saying “enjoy riding an elephant”, I came across this ONE tour, from about 20 other tours, which had in capital letters “NO RIDING”. I was instantly drawn to this tour, enquired about what the tour included and decided to go on this one. Because it was very pricey, I only did the half-day tour which was the perfect amount of time to bond with the elephants and have a delicious lunch at the end of the tour. The night market is the hype of the evening in Luang Prabang. With it’s beautiful stalls full of handmade goods and clothing and fresh food stalls all down the street, the night market is one of the best I have ever witnessed. It isn’t your typical ‘tat market’ where it is all just cheap-looking souvenirs. After a quick few buys at the night market, you should stop buy a place called Utopia. This is a very popular place for travellers to relax, enjoy a few cocktails and take a nap from all the travel chaos. Utopia offers comfortable seating for a relaxing nap, a tasty looking menu, a sports court to include a round of volleyball and early morning yoga. There is something for everyone which is why it has become so popular in the last few years. Me and a fellow traveller I met there spent the last morning before my flight enjoying the peace and quiet as the sun rose to a new day. What was your highlight in Luang Prabang? Have you been anywhere else in Laos?